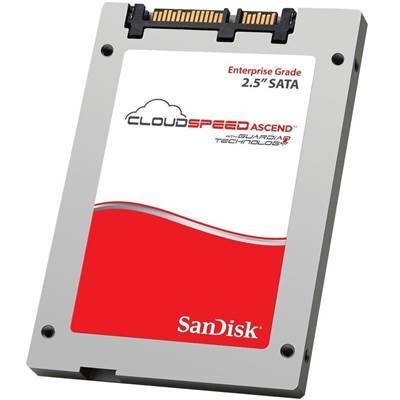 SanDisk's CloudSpeed Ascend SSDs target read-intensive application workloads, such as file servers, Web-based applications, and virtual tape libraries (VTL). Along with SanDisk's Guardian Technology platform and the latest generation of consumer multi-level cell (MLC) NAND flash technology, they deliver all the features expected from an enterprise-class SSD-at a great value. Web-based applications are applications that leverage the Web for connectivity to end-users-typified by enterprise resource planning (ERP), customer relationship management (CRM), end-to-end supply chain management, and logistics/distribution. All of these are end-to-end applications-enabled by the Web-that touch multiple business units within an enterprise, resulting in more efficient business processes. In some cases, as with supply-chain applications, these applications are also accessed by organizations outside the enterprise, such as business partners that support supply-chain management. SanDisk data center SSDs allow organizations to optimize processing speed to achieve high levels of storage capacity, with improved caching and faster Internet functionality.